Paleo-Indians hunted Ice Age mammoths and ancestral bison in what is now Roxborough, Colorado. In 1820, Stephen A. Long's expedition traveled west across the plains into America's western frontier and camped along the South Platte River where water rushed into the Platte Valley from Rocky Mountain peaks. They discovered an area described by their geologist as "a range of naked and almost perpendicular rocks . . . resembling a vast wall, parallel to the base of the mountain . . . the whole scenery truly picturesque and romantic." During the next 200 years, Roxborough has been home to Native Americans, mountain men, homesteaders, farmers, miners, dam builders, ranchers, railroad men, cowboys, and rocket scientists. Families live in sight of hogback formations, soaring red rocks, foothills, and mountains. Thousands arrive each year to hike trails in Roxborough State Park, Waterton Canyon, Colorado Trail, and Highline Canal. 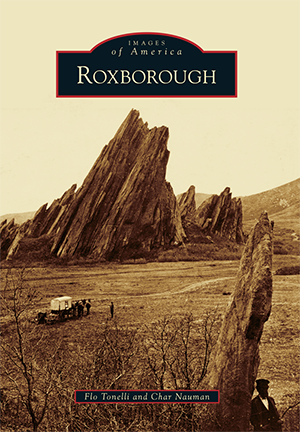 Roxborough's history, geologic wonders, and wilderness is a story of those whose eyes reached toward the stars. Authors Flo Tonelli and Char Nauman share a love for Roxborough. Both have lived in Roxborough Park for decades and are members of the Roxborough Area Historical Society. For this book, they searched for information and images from dozens of sources.